As I sit here working on my late 2013 13″ Retina MacBook Pro (rMPB from here on), I wonder if it will be the last Mac laptop I ever own. That’s a strong statement, I know, but Apple’s pursuit of an insanely stupid “as thin as a knife edge at all costs” design goal has led to a new generation of machines that make them much less portable than they were before…despite being thinner and lighter. Here’t the thing, Apple: Beyond a certain point, thinness is irrelevant. And honesty, you’ve more than reached that point with every laptop you make. You reached that point, in fact, a few years ago. I stopped by the Apple Store today to look at the Apple Watch (summary: amazing tech, but it’s a watch, yawn) and the new ultralight MacBook, which is potentially much more interesting to me than a watch. I spent some time typing (definitely less travel and firmer, but felt fine to me), and looking at the colors (silver—boring, gold—schlocky, space gray—omg perfect!). Speed for simple tasks seemed more than fine, though I’d hate to push it with Motion or Final Cut or anything like that. It’s definitely amazingly thin and light. But the thing I really wanted to look at was the screen. This is a retina device, with a stated screen resolution of 2304×1440. On the MacBook Pro side of the fence, each of the stated pixel values is halved to get the effective ultra-sharp resolution you’ll see in the machine’s default mode. The 13″ rMBP’s 2560×1600 screen is effectively 1280×800 as shipped; the 15″ rMBP’s 2880×1800 gets you 1440×900. In both cases, each full-resolution dimension is halved to find the default usable screen resolution. 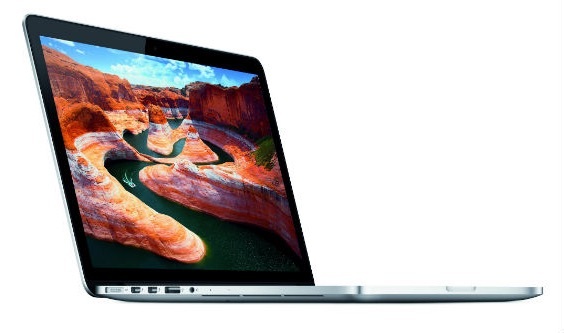 Given that the new MacBook’s screen is 2304×1440, I was expecting to see the display effectively at 1152×720. This is less than you get on an 11″ Air (1366×768), which is odd given the larger screen. I was curious how it would look. I should however, have read Jason’s reviewer’s notebook before heading to the store, as he points out that this isn’t the case. 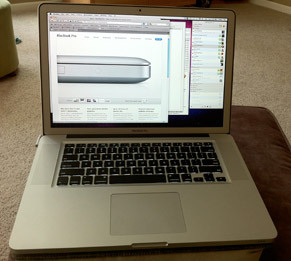 11.6″ MacBook Air: Who needs a netbook? As I’m really enjoying my new 11.6″ MacBook Air, I thought it might be interesting to compare it with some other portables I currently own. Specifically, I wanted to compare the Air to my previous fave ultra-portable Mac (the 12″ PowerBook G4), a Dell Mini 10 running Mac OS X, and my current fave Mac laptop, the high-res anti-glare 15″ MacBook Pro. A while back, I tweeted that my new MacBook Pro was my fave-ever portable Mac—this despite having only used the machine for under two weeks at that point. A few people asked me “why your fave-ever?,” so I thought I’d use those queries as an excuse to post here on my near-silent blog. The specific machine in question is a 2010 15″ MacBook Pro with the 2.66GHz Core i7 processor, 4GB of RAM, and (when new) a 5400rpm 500GB hard drive…and, oh yes, the single most important spec: the anti-glare 1680×1050 high resolution screen. This machine replaced a 2008 MacBook Pro (last of the non-unibody laptops) with a 2.66GHz Core 2 Duo, 4GB of RAM, and a 7200rpm 200GB hard drive (and the only screen at the time, the standard 1440×900). By now, you’ve probably read that Apple’s holding a “Mac-related” presentation on Tuesday at 10 a.m. Pacific. You may have also read the predictions that we’ll see a new iMac introduced at that meeting. The prediction makes sense—the iMac is currently the “gray beard” of the Apple lineup, an aging-if-dependable workhorse that’s made its way into many homes as the first Mac in the household. So predicting that Apple has chosen to upgrade this machine, and swath it in aluminum to match the mini, MacBook Pro, and Mac Pro, is about as risky as predicting that Paris Hilton will make tabloid headlines or that George Steinbrenner will rant about his Yankees’ poor performance at some point during the season. After just under a month on the road (Portland to Austin to Memphis to Austin to Portland), my black MacBook is now back in my possession! The good news: so far, the power adapter isn’t overheating. The bad news: it still makes more noise than I would consider “normal,” though it’s not audible from as great a distance as before. APP-603-9181 ASSY, BEZEL, BEST: I think this is the bezel that goes around the screen. APP-616-0268 BATTLITH LITH, 55WHR, ATL, BLK: A new battery. I guess I understand the battery replacement…but why the screen and bezel? Perhaps the connection between the screen and the machine itself was somehow causing an issue? Or maybe a tech’s screwdriver slipped and gouged the original screen :). In any event, it’s back, and based on the first hour or so of usage (downloading 2.52GB (well, it feels like that much!) of system updates), the overheating problem seems to be resolved. Hooray! Update: After letting the machine run for a good two hours, I felt the power brick, and it seemed notably cooler than before the fixes. To confirm, I hooked up the USB temperature probe, and found that the temperature now maxes out around 94F. That’s a good 30+ degrees cooler than before. So while it’s still warm to the touch, I no longer fear a meltdown if I leave it too close to something made of plastic.